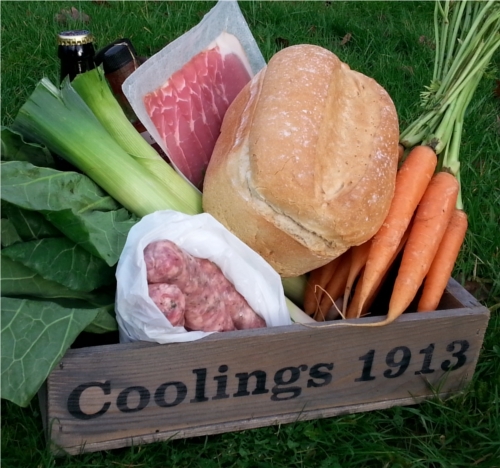 The Keep it Local team host the Food & Produce Markets at Coolings Nurseries. These FREE ENTRY events are held on a regular basis - the fourth Saturday of every month and run from 9:00 - 13:00 whatever the weather. The first event was held in January 2014 on a day when we were lucky to have sunshine sandwiched between two nights of torrential rain. We regularly have in excess of 500 visitors and 10 - 25 stalls selling fresh local food and associated products. We're very proud of our meat stall - Annabelle's meat is produced on her farm in Mark Cross, just south of Tunbridge Wells. It is without doubt the consistently highest standard of meat I've ever tasted. Just try the Olde English sausages, you'll never eat a different one! We live in The Garden of England - let's make the most of the wonderful, abundant food in such close proximity! 26th January - winter root vegetables for delicious stews around the fire. 23rd March - a promise of warmth to come. Purple sprouting and lovely rich cabbage abound. 27th April - a good season will see the first new potatoes and asparagus appear. 25th May - careful searching might give you early peaches and apricots. 22nd June - beans and peas, soft fruits - strawberries and cherries amongst others. 27th July - salad vegetables are in abundance; full of flavour and colour. 24th August - the start of the game season and the plums are ripe. 28th September - the Autumn season starts with swiss chard, mushrooms and runner beans. 26th October - squashes, brussels, fresh figs and celeriac are all coming to the table. 23rd November - time for juicy British stews and soups as the evenings draw in. 29th November - 1st December - three days of festive food inside with the craft show.